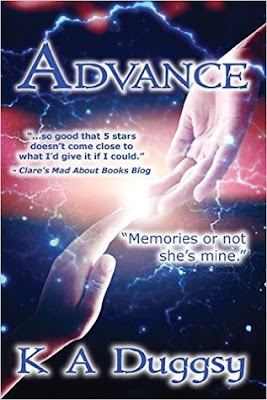 Advance by K. A Duggsy is the first book in the Advance industry series. This is not a book I would voluntarily read as sci-fi is not really my thing. However, as the book was part of the Quirky Blind Date with a Book programme, I was assigned this title for review. I have to say I was pleasantly surprised by the outcome. With a unique concept and interesting characters, Advance will quickly pull you in and keep you entertained to the end. From the moment I started reading, I figured I would be in for a treat. Fast-paced and with many surprises I eagerly turned the pages as I could not wait to discover how the story would unfold. I was intrigued by the concept of bodies being created in a lab coupled with the theory of time travel and teleportation. The themes may not be unique but the way it was portrayed was new. K.A. descriptive writing style made everything come to life, and I felt I was in the middle of the events taking place. The world in Advance is broken down into two socio-economic levels. There is the rich who are swimming in luxury and then there are those who are barely surviving and as a result end up being homeless. Advance Industries has invented a new device which would revolutionize the manner in which citizens travel. However, there is one drawback subjects are required for final testing and who better to conduct these tests on but the homeless. After all, who would miss them if anything should go wrong? The story develops through the eyes of Faith, Kye and Fraser. Faith is a prime example of a strong heroine. I admired her strength, determination and selflessness. She is a well-rounded heroine, which was demonstrated in her strengths and flaws. Her impulsive behaviour and stubbornness placed her in tenuous situations and in the process placed others at risk. Despite me not agreeing with her putting others at risk, I understood the reasons behind her actions. Kye shared some of the same traits as Faith in that he is determined and impulsive. His impulsiveness. However, made him reckless. He did things without having a plan in place, which I thought strange for someone who is the leader of a group responsible for maintaining law and order. Given what he and Faith had been through, I expected him to be cautious in his actions. I understood his need to be protective of Faith, but I found his behaviour cloying and bordering on abusive. His constant reference of her belonging to him demonstrated his possessive nature. Besides him being possessive, he was insanely jealous. Fraser is an interesting character. At first, I was not sure what to make of him, but as the story progressed, his intentions became clear and Faith will discover life is not as simple as it seems. Who can she trust to tell her the truth? Although I enjoyed the story, I had a few issues. This is the first book in the series. However, I felt I was thrust into the middle of the story. I say this as based on the narration it is clear the main characters story started before this installment. It would have been great to have the story of how they met, and the events, which transpired during this time. I wish I could go in to all the issues I had, but doing so will reveal too much of the story. All I can say is some of the reveals were shocking, but could have done with a little more development. The ending was the least favourite part of the story as it ended in a cliffie. Darn! I hate those cliffhangers. Advance is a story filled with drama, suspense, romance and intrigue. I believe this is a great start to the series and I am looking forward to see what is next in store for these characters. Faith Elaina is a reporter in the new world. She has no friends and no family... or so she believes. When she is approached with an intriguing tale by a homeless man claiming to be the missing Professor Laudnam, she finds herself agreeing to embark on a fact-finding mission to expose Advance Industries. They are a multi-national corporation and leaders of scientific breakthroughs. They push the boundaries in experimentation in order to sell viable products to the market. Their latest invention known as Advance is the most exciting yet. A system designed to transport humans from one place to another efficiently and effectively.